From Collins Ralston of Huntington, Indiana on 10/20/2018 . My grandpa always gave us these in the summer. I can wait to place an order! So glad they are available online! just the way we like them ! crisp and tangy, we use them on everything, sandwiches to pizza ! From Janet Maher of Joliet, Illinois on 3/4/2018 . I ordered these for my husband. He actually wanted the Hot peppers and was upset that I got these instead. However he was pleasantly surprised that they were so tasty. From Anonymous of Springfield, Illinois on 1/15/2018 . 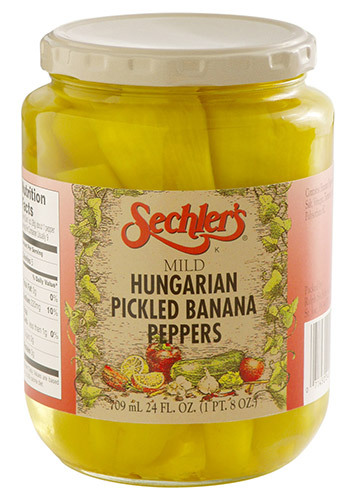 You cannot find whole banana peppers anywhere. My husband was so excited when he found them on our front porch! From Bridget Murphy of Milwaukee, Wisconsin on 12/7/2017 . I purchased these peppers as a gift for my brother who just loves them. He was able to purchase these at a local grocery store but hasn't been able to find them recently. I was so pleased to be able to purchase through your web site. Thank you so much!